A summary of geological facts on Chalk, selected for you by a professional geologist. The Concise Oxford Dictionary definition of Chalk is a 'white soft earthy limestone used for burning into lime and for writing and drawing. The word Chalk has become part of the English language with phrases such as 'different as chalk from cheese', 'by a long chalk' and 'chalk it up', the latter being a common saying in English pubs, when scoring in the game of darts. An alternative description might read; a soft, earthy substance, of a white, grayish, or yellowish white color, consisting of calcium carbonate, and having the same composition as common limestone. Do you believe everything that is written (on Chalk)? In England the Chalk topographically forms what are known as the 'Downs' in southern and eastern counties. It is exposed in quarries and roadcutting but the best exposures are along the coastlines where Chalk often forms spectacular clifflines, the most famous of which are the 'White Cliffs of Dover.' It is comprised of a sequence of mainly soft, white, very fine-grained extremely pure limestones which are commonly 300-400 m thick. These rocks consist mainly of coccolith biomicrites formed from the skeletal elements of minute planktonic green algae, associated with varing proportions of larger microscopic fragments of bivalves, foraminifera and ostracods. The planktonic coccoliths and many of the foraminifera (the planktonic species) lived floating in the upper levels of the oceans. When they died their skeletons sank to the bottom, combining with the remains of bottom living bivalves, foraminifera and ostracods, to form the main components of the Chalk. A scanning electon microscope photograph of a coccolith (after singleton birch). Flints are a well known component of Chalk and they are present as nodular seams, tabular beds ann linings to fractures, and characterise the upper parts of the Chalk sequence. They comprises a random mosaic of quartz crystals, only a few microns in diameter, interspersed with minute water-filled cavities. The silica was derived from the dissolution of the siliceous skeletons of sponges and other organisms and has been redistributed in the form of nodules during several stages of crystallisation. The earliest precipitations of Flint occurred near organic remains such as burrow-fills or other decaying debris. Further accretion gave rise to either isolated nodules or layers of tabular flint. The preservation of uncompressed fossils such as Echinoids and Ammonites in flint indicates that the replacement commenced early in the lithification of the chalk. However, the presence of flint sheets along joints and faults shows that the quartz remained mobile and recrystallised during subsequent burial, folding and faulting. The flint beds closely parallel the bedding and are valuable tool in the correlation of the Chalk. Inside flints you can sometimes find a white or cream coloured soft powdery chalk inside flints. It is known to geologists as "flint meal". Fossils such as echinoids can be present within flints. Traces of very fine grained quartz also occur throughout the Chalk, but overall comprise less than one per cent of the rock. At various levels clay material occurs as discrete seams or layers. Locally these may rest on minor erosion surfaces. Many of the marl seams which comprise both quartz and clay minerals such as Illite and Smectite provide persistent marker horizons which can be recognised regionally. Phosphate minerals are widespread in the Chalk and localised concentrations occur as impregnations and coatings on the sediments, or as pelletal concretions. It is often most conspicuos where depostion ceased for a time and the upper surface of the sediment became compacted (hardgrounds). Glauconite occurs in minute quantities throughout the Chalk, but is concetrated at some horizons (commanly at hardgrounds again) as detrital grains or as encrustations or replacements. Finely disseminated pyrite is also common and sometimes pyrite concretion are present with radiating crystals. At some horizons the clay content of the Chalk is higher, particularly at the base where in England the Chalk Marl was deposited. This grey and relatively impermeable Chalk was the main tunnelling horizon for the Channel Tunnel. Higher in the Chalk the Plenus Marl and thinner marls seams occur. The Chalk often shows a distinctive cyclicity, plus it can be both massive at some horizons and nodular at others. 1. Many of us of the older generation remember blackboards and chalk, although my children now tell me that whiteboards are predominant in schools now. However, the stick of chalk is many peoples concept of what Chalk is, very uniform in composition. Not all of the Chalk is like this. 2. Many might consider all Chalk to be white in colour. While the greater majority may be white when fresh, when weathered it becomes grey with common red iron staining. There are also Red Chalks (Norfolk, Yorkshire and the North Sea) and Grey Chalks (the Chalk Marl or Craie Grise in France). In beds where Glauconite common it is greenish in colour. How white are the cliffs in these photos of the 'White Cliffs of Dover'? Although many people worldwide might considerer Chalk to be found mainly in England this is far from the case and many of the names associated with the Chalk originate from mainland Europe, such as the Maastrichtian Stage, named after Maastricht in SE Holland. Indeed, Chalk facies occur over much of NW Europe (inclusive the North sea) and are known as far afield as Austin in Texas (Austin Chalk Group). The Strait of Dover, separates England from France and the European continent, and connects the English Channel and Atlantic Ocean with the North Sea. The limits of the strait on the English coast are defined as the promontories of Dungeness and South Foreland; on the French coast, as the promontory of Cap Gris-Nez and the town of Calais. The strait is 34 km (21 miles) wide. Both the English and French shores are mainly formed by chalk cliffs, with what many consider to be classic location of the 'White Cliffs of Dover' occurring between Dover and the South Foreland (St. Margaret's Bay). The layers of chalk on both sides show that in prehistoric times a land connection between England and France existed here. When a drop of dilute hydrochloric acid is placed on a piece of Chalk, the acid reacts with the calcite and forms bubbles of carbon dioxide. This "fizz" reaction is so characteristic of limestone than many geologists carry a small bottle of dilute hydrochloric acid into the field for a rapid and easy identification of limestone. When heated, the calcium carbonate in Chalk decomposes to lime, or calcium oxide. The fossil content of the Chalk of NW Europe, particularly the abundance and diversity of the planktonic foraminifer and coccoliths indicates tropical water temperatures of 20 0C or more. This has been confirmed by oxygen isotope analysis. Normal marine salinities are indicated by the fossil assemblage which comprises a normal marine assemblage which does not include species thought to be representative of lower salinity environments such as estuaries. The Chalk of NW Europe was deposited on the continental shelf during the earliest stages of the opening of the Atlantic Ocean (Biscay to Labradore opening at the beginning of Chalk deposition) . The sea level was much higher than the present day with the Chalk of Kent typically being deposited in a depth range of 100-300m. The sea levels varied through its deposition. However, not all Chalk was deposited at this depth with some marginal (shallow) marine deposits being recorded both in Devon and NW France. The Chalk often shows a distinctive cyclicity (on a 1m or so scale) which has been linked to variation in the climate at the time of deposition (Milankovitch cycles). The lack of coarser clastic material in the majority of the Chalk, with quartz being most common in the clay size grade, indicates clear seas with minimal eroded products being transported from the landmasses at the time. 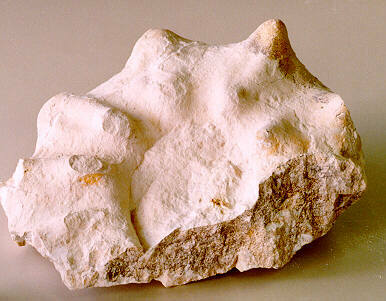 Indeed, much of the clay sized quartz and clay may be airborn and of volcanic origin. Dinosaurs, Mesosaurs and Ammonites become extinct. End Cretaceous uplift begins in Europe. Most of Europe and a great proportion of the continents of the world are submerged. Chalk facies are widespread. Regional downwarping largely replaces block faulting in NW Europe. A progressive transgression continues which started in the Albian. Recently in the UK, Prof. Mortimore of Brighton University has reviewed the geological subdivisions of the UK Chalk. His new practical subdivision uses a combination of lithostratigraphy, biostratigraphy and chronostratigraphy and has replaced the older biostratigraphic subdivision of the Chalk used by the British Geological Survey. This zonation tended to be biased towards the use of fossils such as Ammonites. Ammonite from the N. Lincolshire Chalk (after singleton birch). The Chalk has long been considered to be a period of relatively quiescence in terms of mountain building and therefore little attention was paid to tectonic phases within the Chalk. These are now known to have occurred, plus much of the sedimentaion is now thought to have been controlled by local and individual structural blocks. Faults in the UK are generally of a displacement of less than 10m, commonly in the range 1-5m. There are typically 3 sets of major joints, one subhorizontal and subparallel to the bedding, one conjugate set of high angle and one conjugate set of subvertical joints. Jointing is partly controlled by lithology, joints often terminating at bedding planes, with high angle fractures being more typical in marly chalks. In Yorkshire the chalk of the Yorkshire wolds and the cliffs at Scarborough are much harder than the chalks of Southern England and exhibit stylolites. Chalk is perhaps most associated with a gently rolling landscape such as the North and South Downs in England. As it can be dissolved by rainwater it is Karstic with such features as caves, sink holes and karstic cavities occurring along faults, flints and marls. The scarp slopes of the Downs were oversteepened during the Ice Ages. Chalk cliffs (of Southern England and NW France), due to their weakness, erode relatively quickly, yet the interbedding of weak and stronger layers allows high cliffs to form. When these fail, large landslips occur. The valley system has long been related to a greater intensity of fracturing and faulting in the valleys. This may not be the entire cause, rather many of the valleys may be related to the gentle synclines between the gentle domes (structural) of the Chalk, with the water migrating laterally (along the marl and flint layers) firstly down the dip slopes of the domes and then along the regional dip slope in the synclines, these preferentially eroding to form valleys. The Chalk of NW Europe has been used as a major source of drinking water. It is generally highly permeable (typically in the range 10-7 to 10-3 m/sec), the water migrating mainly through the fissure system and being stored mainly in this system. Where this has been enhanced by karstic development the permeability can be very high. Chalk was initially 'tapped' by using wells, often deep. By the time of the Industrial revolution and with the advent of steam power shafts could be sunk and adits driven to tap the major fisures, and the water could be effectively pumped to the surface. Cities such as London and towns such as Brighton took advantage of this source of drinking water. With the advance in drilling and pumping technology in the latter half of the 20th century it became possible to drill deeper wells for water, mainly located in the valley systems and often located at the intersections of faults. Chalk is not a single aquifer as there can be perched acquifers within it, the Plenus Marls acting as a major one. Thin marls can result in the lateral migration of water with the dip for long distances. Chalk has played a major role in our prehistory in NW Europe. The Downs and Chalk highlands are thought to have been more intensely farmed and less wooded that the lowlands and their high permeability (quick drainage/lack of surface drainage) made them ideal for transport routes. These routes were still in existence in Medieval times (Saxon Way in Kent). Major prehistoric sites such as Stonehenge were built on Chalk. Chalk mines with shafts and adits were excavated by farmers to provide them with fertiliser. The major prehistoric use was not of the Chalk itself, but of the flints within the Chalk, which are known to have been used as tools by prehistoric man (eg. Boxgrove Man) as long as 500,000 years ago. Flints are known to have been traded over long distances throughout Europe. Chalk caves were also important for shelter at this time. What is Chalk used for? 1.Finely prepared chalk, used as a drawing implement, most commonly in teaching. It can also be used in the Fine Arts; a drawing made with crayons. Red chalk, an indurated clayey ocher containing iron is also used by painters. 2. When heated, the calcium carbonate in limestone decomposes to lime, or calcium oxide. This is both used in the making of cement, it is a fertilizer for farmland and as a flux in smelting copper and lead ores and in making iron and steel. 3. Chalk line, a cord rubbed with chalk, used for making straight lines on boards or other material, as a guide in cutting or in arranging work. 4. Chalk mixture, a preparation of chalk, cinnamon, and sugar in gum water, has been much used in diarrheal affection, esp. of infants. 5. Gymnasts use chalk on all six aperatuses. It creates friction between the surfaces of the hands (or the feet, in the cases of floor and vault) and the aperatus, allowing gymnasts to perform their skills. 6. Chalk is used on snooker and pool cues. 7. Disused Chalk pits might be considerde for waste disposal, however, the high permeability of the Chalk means that this could only occur when the aquifer from which much drinking water is obtained is unaffected-therefore never. A much more appropriate use is for development such as has recently happened at the Bluewater shopping complex (the largest in Europe?) near Gravesend in Kent and the development of Shoreham Cement Works near Brighton in Sussex. For a comprehensive listing of uses and a desription of the modern prodution procedures from a Company involved in the production of lime. The long relationship between man and the Chalk since prehistoric time has clearly impacted on our modern perception of the Chalk, and this has been reinforced by phrases within the English language, and perhaps most particularly in the 19th and 20th centuries, by the use of Chalk on blackboards in schools. However, it is the properties of Chalk that are the key to its importance. It can be soft, yet not too soft, weak yet not too weak; it contains within it a very hard material called flint; it can be highly permeable and store water, yet impermeable in places; it is easily quarried and tunnelled through; and its chemical composition allows it to be used as a fertiliser and to make cement. Visually, the 'White Cliffs of Dover' and Chalk cliffs of France have formed the greatest impression, yet those of the South coast of England and Yorkshire are perhaps more spectacular.